[147 Pages Report] The Aerospace Interior Adhesive Market is projected to reach USD 1,101.7 Million by 2021, at a CAGR of 5.35% from 2016 to 2021. Both, top-down and bottom-up approaches have been used to estimate and validate the size of the market, and estimate the sizes of various other dependent submarkets in the overall aeropsace interior adhesives market. The research study involved the extensive use of secondary sources, directories, and databases such as, Hoovers, Bloomberg, Chemical Weekly, Factiva, ICIS, Securities and Exchange Commission (SEC), among other government and private websites, to identify and collect information useful for the technical, market-oriented, and commercial study of the global aeropsace interior adhesives market. Polyurethane is manufactured from various raw materials, such as, solvents, pigments, additives, and resins. The major manufacturers of aeropsace interior adhesive are Henkel AG & Co. KGaA (Germany), Huntsman Corporation (U.S), Avery Dennison (U.S.), Arkema S.A. (France), Solvay S.A. (Belgium), Hexcel Corporation (U.S.), 3M Company (U.S.), Delo Industrial Adhesives (Germany), Master Bond Inc.(U.S.), and Permabond LLC (U.K.). The market is further analyzed on the basis of key countries in each of these regions. 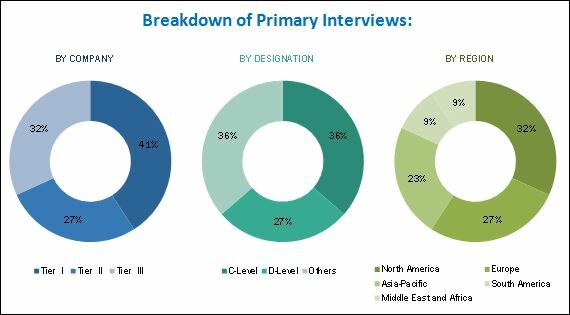 Country-level analysis of the global aeropsace interior adhesives market, by resin type, product type, and aircraft type. The aerospace interior adhesive market is projected to reach USD 1,101.7 Million by 2021, at a CAGR of 5.35% from 2016 to 2021. 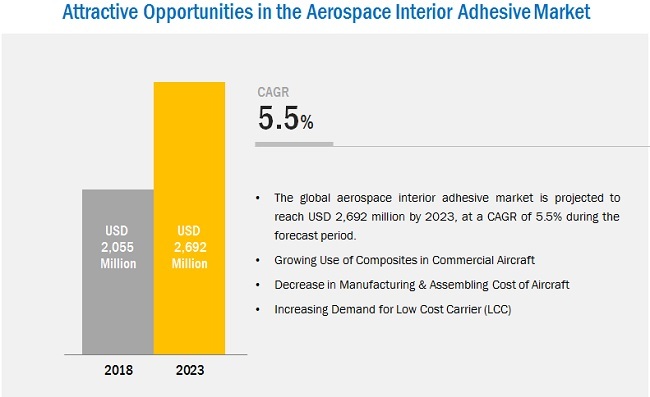 Decline in aviation fuel prices, growing air traffic in low cost carriers, and procurement of new aircraft by airline operators for modernization of fleet are the key factors expected to drive the growth of the aerospace interior adhesive market. Large wide body aircraft type was the largest segment of the aerospace interior adhesive market. Large wide body aircraft are four-engine jets with seating capacity up to 850 passengers. The demand for large wide body aircraft is higher for routes with high traffic, often connecting international destinations. They are passenger’s first choice, due to factors such as comfort, flexibility, and efficiency. Large interior space, wide range of cabin interior, and suitability for long-haul flights are the major factors anticipated to drive the growth of the segment. On the basis of resin type, the aerospace interior adhesive market has been segmented into epoxy, polyurethane, acrylic, cyanoacrylate, and others. Epoxy is projected to be the fastest-growing segment in the aerospace interior adhesive market between 2016 and 2021. 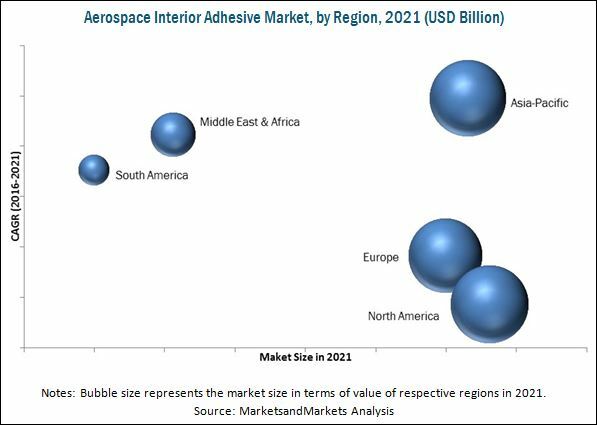 North America, Europe, Asia-Pacific, South America, and Middle East & Africa are considered the key regions for the aerospace interior adhesive market. North America led the aerospace interior adhesive market, in terms of value & volume, due to the presence of major aircraft manufacturers in the region. The major players in the aerospace industry are involved in several business activities. Bombardier Inc. (Canada), The Boeing Co. (U.S.), and Honeywell Aerospace (U.S.) have opened assembly plants in Mexico to increase their market share and cater to the increase in demand for aerospace interior adhesives from the aerospace industry. Environmental regulations is a major factor that may restrain the growth of the aerospace interior adhesive market. Stringent regulations govern the use of materials in aircraft interiors, which includes the type of adhesives used in forming the components and structure of an aircraft cabin. The three major factors considered in the aerospace industry are passenger safety, weight management, and aesthetics. From safety point of view, there are various regulations which impact the selection of materials for aircraft interiors to ensure passenger safety. The Federal Aviation Administration (FAA) and the European Aviation Safety Agency (EASA) are responsible for regulations that cover fire testing requirements for flame retardancy and fire, smoke, and toxicity. Any materials which are used in aircraft have to pass all the safety standards. The key players operational in the aerospace interior adhesive market include Henkel AG & Co.KGaA (Germany), Huntsman Corporation (U.S), Avery Dennison (U.S.), Arkema S.A. (France), Solvay S.A. (Belgium), Hexcel Corporation (U.S.), 3M Company (U.S.), Delo Industrial Adhesives (Germany), Master Bond Inc.(U.S.), and Permabond LLC (U.K.). Diverse product portfolios, strategically positioned R&D centers, adoption of development strategies, and technological advancements help strengthen the market positions of these companies in the aerospace interior adhesive market. These companies are adopting various organic and inorganic growth strategies, such as agreements, partnerships, mergers & acquisitions, and new product launches to enhance their current market shares.